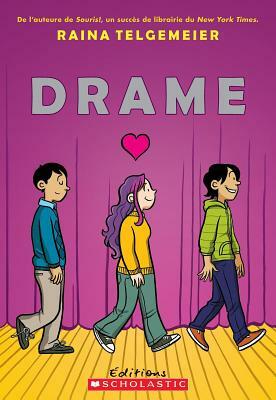 Raina Telgemeier a grandi ? San Francisco. Apr's avoir obtenu son dipl?me ? la School of Visual Arts de New York, elle a publi? plusieurs bandes dessin?es ? succ?s. Elle a aussi adapt? et illustr? les Baby-sitters Club, qui figuraient sur les listes Great Graphic Novels for Teens (Young Adult Library Services Association -YALSA) et Top 10 Graphic Novels for Youth (Booklist, American Library Association - ALA) en 2007. Raina Telgemeier grew up in San Francisco, and moved to New York City to study illustration at the School of Visual Arts. Her comics have been nominated for the Ignatz, Cybil, and Eisner Awards, and have appeared on the web, in magazines, and in various anthologies. She is the adaptor and illustrator of the Baby-sitters Club graphic novels which were selected by YALSA for their Great Graphic Novels for Teens list in 2006, as well as ALA's Top 10 Graphic Novels for Youth list.